HOUSTON (KTRK) -- Police say a multi-vehicle crash in southwest Houston escalated into a shooting and the search for the gunmen is still ongoing. 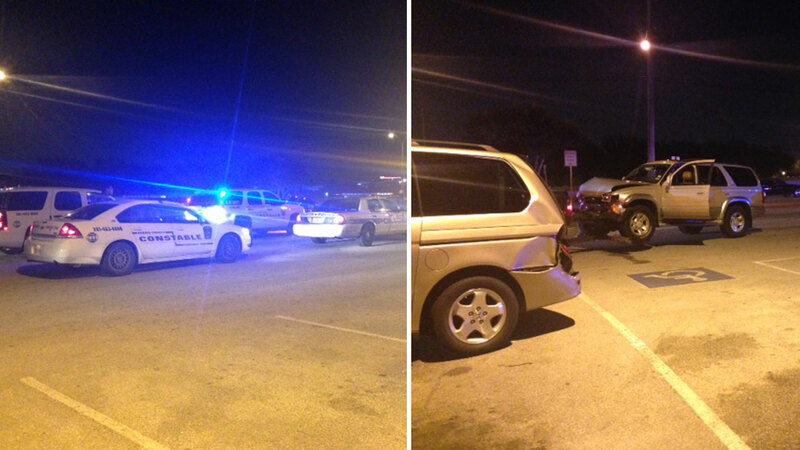 It happened Friday night off Bellaire Boulevard and Beltway 8. When Chase Sullins was in the accident. When he was thrown forward in his seat -- the car behind smashing into his -- he said he went into auto-pilot mode. "There is not enough time to panic; it's either you either accept or you can get on the side of the road, and I wanted to do something useful because I was alright," he said. "Everybody's fine everybody safe so I immediately started checking traffic but that last car to me was empty," he said. What police found in that car, a black Durango, was a gun. The driver and passenger were gone. Police said a man and woman had taken off into Arthur Storey Park. Investigators believe they ran after opening fire from the Durango. Police don't know whether this was road rage. Police are trying to determine if the gunfire caused the chain reaction crash that left several people shaken. Police earlier had search dogs combing the area around the lake but they have since called off the search.